In 1868, Commander-in-Chief John A. Logan issued general order #11 calling for all Departments and Posts to set aside the 30th of May as a day for remembering the sacriﬁces of fallen comrades, thereby beginning the celebration of Memorial Day. The G.A.R. founded soldiers’ homes was active in relief work and in pension legislation. Five members were elected President of the United States, and for a time, it was impossible to be nominated on the Republican ticket without the endorsement of the G.A.R. voting block. With. membership limited strictly to “veterans of the late unpleasantness,” the G.A.R. encouraged the formation of Allied Orders to aid them in various work. Numerous male organizations jousted for the backing of the G.A.R. and the political battles became quite severe until the G.A.R. ﬁnally endorsed the Sons of Veterans of the United States of America (later to become the Sons of Union Veterans of the Civil War) as its heir. The ﬁnal Encampment of the G.A.R. was held in Indianapolis, Indiana in August of 1949. Prior to disbanding and before the death of its last member, the Grand Army of the Republic officially designated the Sons of Union Veterans of the Civil War as its successor and heir to its remaining property. 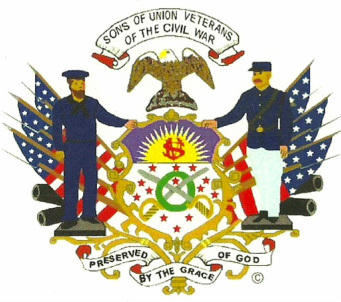 The Sons of Union Veterans of the Civil War (SUVCW) is a volunteer, non-profit, charitable, fraternal, patriotic and educational organization similar to the Grand Army of the Republic, the largest Union Civil War veterans’ organization. The SUVCW is officially recognized as the G A.R.’s legal successor, receiving its Congressional Charter in 1954 (Public Law 605). The SUVCW cooperates in doing honor to all who have patriotically served our country in any war. The Order participates with other organizations in the proper observance of Memorial Day (May 30th), which was established by the G.A.R. in 1868, seeks out and marks the graves of Civil War veterans; observes the care and upkeep of Civil War Memorials and brings any failure to do so to the attention of the proper authorities. The SUVCW has twenty-six state-level organizations (Departments), representing thirty-six states and over 200 local chapters (Camps) across the country. A National Membership-at-Large is also available for those who live in states that are not yet served by a local Camp. The highest governing body of the SUVCW is the National Encampment, chaired by an officer of the corporation, whose title is Commander-in-Chief. Officers and Departmental representatives convene annually at the National Encampment to conduct corporate business and to elect officers. Officers at the Camp and Department level are also elected annually to carry out SUVCW plans and programs. The National Organization publishes the quarterly Banner, containing news of activities in the various Departments, at the National level, and other items of interest to the membership. Many Camps and Departments also publish newsletters, keeping their members informed of local meetings, programs and events. Camp and Department activities vary, but all work in support of the organization's missions. Patriotic presentations during regular Camp meetings and historical outings increase the knowledge of the Camp and make for a more informed membership. Presentations are given to schools, historical and genealogical organizations. SUVCW members participate in a variety of ceremonies, designed to honor Union veterans of the Civil War and veterans of all U.S. conﬂicts. The most important of these is Memorial Day. Other local ceremonies may be held on Lincoln’s Birthday, Flag Day, Independence Day, and Veterans Day. Many camps hold a grave re-dedication ceremony when a Union soldier's worn headstone has been replaced with a new one. Union soldiers’ grave registration efforts are part of a National program. They also participate in similar events when historical plaques and monuments are introduced or restored in their community and when requested to assist local veterans’ groups. Many Camps and Departments promote the ideals of good citizenship and patriotism that the G.A.R advanced by presenting awards to deserving Eagle Scouts and ROTC cadets, recognizing their achievements. In addition, the SUVCW's talents have augmented local and national historical preservation groups’ efforts for decades. Members actively work to assess and preserve Civil War battleﬁelds and artifacts, Grand Army monuments, facilities and records in their communities. Much pleasure is to be gained by associating with dedicated people and realizing preservation accomplishments. Annually, many Camps also contribute money to Civil War battleﬁeld preservation. Preserving & Perpetuating the G.A.R. The SUVCW assists in the preservation and making available for research, the documents and records pertaining to the Grand Army of the Republic and its members. The Order ensures that the condition of signage along U.S. Route 6, the G.A.R. highway, is properly maintained. The SUVCW supplies scholarships, funding to the annual Lincoln Memorial and Tomb Ceremonies, and to the Gettysburg Remembrance Day Ceremony, which includes the country's largest Civil War parade, held on the third Saturday in November. The Order provides grants for Civil War Memorial preservation. Meetings and Encampments (conventions) are still conducted according to the tradition and rituals of the G.A.R. The SUVCW's patriotic education includes teaching patriotism and the duties of citizenship, the true history of our country, and the love and respect for our Flag. Each year, the Order conducts presentations to schools and communities. The SUVCW encourages the proper teaching of American history in our schools. It keeps the public informed of activities and measures that violate or may weaken the spirit and purposes of our country's Constitution and institutions. It promotes and broadly sustains the American principles of representative government, of equal rights and impartial justice for all. 1.) “Be directly descended (as a son, grandson, great grandson, etc.) from a Soldier, Sailor, Marine or member of the Revenue Cutter Service who was regularly mustered into, served honorably in, and was honorably discharged from (or died while in service to) the Army, Navy, Marine Corps or Revenue Cutter Service of the United States of America or in such state regiments that were called to active service and were subject to the orders of United States general officers, between April 12, 1861 and April 9, 1865. Or — be directly descended from a brother, sister, half-brother, or half-sister of a Union soldier or sailor etc. (as described above), thus being his nephew, grandnephew, great grandnephew, etc. 2.) Never have been convicted of any infamous or heinous crime. 3.) You and your ancestor, through whom membership is claimed, must never have voluntarily borne arms against the government of the United States. Many Americans have ancestors who served the Confederacy as well as other ancestors who served the Union. Membership is granted in the SUVCW as long as the ancestor who served the Union was never in service to the Confederate States of America. If the National Archives do not have information on ﬁle for a Union soldier or sailor, a state-level Adjutant General Report may have a brief description of his military service (if he served in a state volunteer regiment rather than in the “regular” United States military). 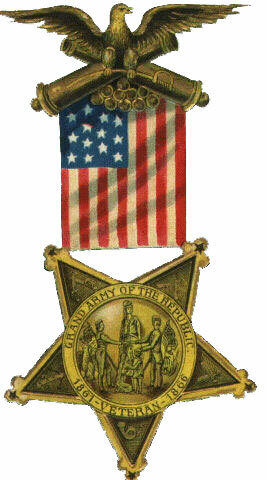 This would then be acceptable as proof of honorable service to the Union. This type of brief service record is available from corresponding State Archives and from larger public libraries (that house the Civil War related Adjutant General Reports for various states that organized volunteer regiments). Those who do not have a Union ancestor, but who still wish to support the Order, may join as an Associate. The Associate has the same privileges as a Member, in that he can vote at camp elections and hold Camp office. Up to 33% of a Camp's total membership may consist of Associates. Associates must be at least 14 years of age and have never borne arms against the U.S. Government. Not all Camps accept Associates. SUVCW officers and members at formal gatherings, on parade, or other duty of the Order, wear the organization's membership badge on the left breast of their clothing. Those who have held or currently hold command positions at the Camp, Department and National level are also recognized by a unique badge. Badges are also awarded for military service and longevity. Badges are available for sale from the National Quartermaster. Many of the SUVCW’s objectives could not be attained without the support of its Auxiliary. Originally organized as the Ladies Aid Society in 1883, the Auxiliary to the Sons of Union Veterans of the Civil War (ASUVCW) is composed of like-minded women, who share the interests and goals of the Sons. They work alongside the SUVCW during special events, ceremonies, and presentations. Many Camps have Auxiliaries affiliated with them. The ASUVCW’s structure and meetings are similar to the SUVCW's. Membership is open to both those with and without ancestry. Wives, daughters, mothers and adopted daughters of SUVCW members are invited to join. A Junior membership has been established for girls eight to twelve years old. Together with the Daughters of Union Veterans of the Civil War (DUVCW), Ladies of the Grand Army of the Republic (LGAR), and the Woman's Relief Corps (WRC), the Sons and Auxiliary form the "Allied Orders" to the G.A.R.